Conceit or modesty aside, even the most accomplished and prolific songwriters could seldom attest to having created a genuine masterpiece. 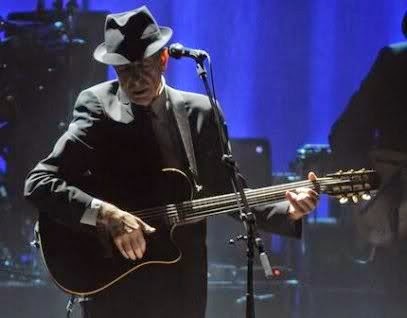 Leonard Cohen is of the rare few who can, of course, but last Thursday night at the Beacon Theatre it was abundantly clear that he could lay claim to far more than one. Taking the stage for his first American concert in fifteen years, Cohen received a reverent welcome by the sold-out audience, its applause overlapping the opening bars of “Dance Me To The End of Love.” Dressed to the nines in a dark suit with bolo tie and fedora, the 74-year-old bard cut a distinguished figure, his sophic disposition tempered by a laconic, often self-mocking sense of humor. What Cohen imparted most, though, was a selfless commitment to his songs. After a mirthful trip through “The Future”—during which he pirouetted as the ominous “white man dancin’”—and having plead his case on “Ain’t No Cure For Love,” he dropped to his knees at the start of “Bird On The Wire,” turning out a truly stunning rendition that soon saw him singing at full stride. Likewise, he enlivened an avalanche of imagery and delicate melodies on “Chelsea Hotel No. 2” and “Hey, That’s No Way To Say Goodbye,” his rich voice at times recalling the lissome timbre of his younger days. The esteem to which Cohen paid his compositions extended to his superb nine-piece band. Each time a musician soloed—as when guitarist Javier Mas played a gorgeous, flamenco-styled prelude to “Who By Fire?”—or when a background vocalist assumed a leading role, as did long-time collaborator Sharon Robinson on a soulful version of “Boogie Street.” Cohen stood aside in deference, his hat held to his chest, his face betraying an appreciative smile. The ultimate pleasure and privilege, however, lay in listening to Cohen. With the conviction of one who’d labored more in composing these works than most others could’ve otherwise endured, he stepped into each song—from the understated grandeur of “The Gypsy’s Wife” and “Famous Blue Raincoat” to the synthesized thrust of “First We Take Manhattan”—and rendered each one with rich perception. He recited “A Thousand Kisses Deep” as written in Book of Longing (as opposed to singing the version from Ten New Songs), drawing out evocative lines and phrases in cadenced tones. And at his most transcendent, Cohen surrendered “Suzanne” and “Hallelujah” to those fortunate enough to have attended—to those who knew they’d witnessed something very special. Now, everybody knows.